Disconnect the harness connector from the clutch pedal position switch (if equipped). Disconnect the harness connector from the clutch interlock switch (if equipped). Disconnect clip of harness from clutch pedal. Remove clutch master cylinder rod end from clutch pedal. Remove clutch pedal position switch and clip from clutch pedal (if equipped). Remove clutch interlock switch and clip from clutch pedal (if equipped). Remove pedal pad from clutch pedal. Remove stopper rubber and pedal stopper rubber from clutch pedal, using a suitable remover. After applying recommended grease, press clutch master cylinder rod end into clutch pedal until it stops. Check clutch pedal for bend, damage, or a cracked weld. If bend, damage, or a cracked weld is found, replace clutch pedal. Check pedal stopper rubber (if equipped). 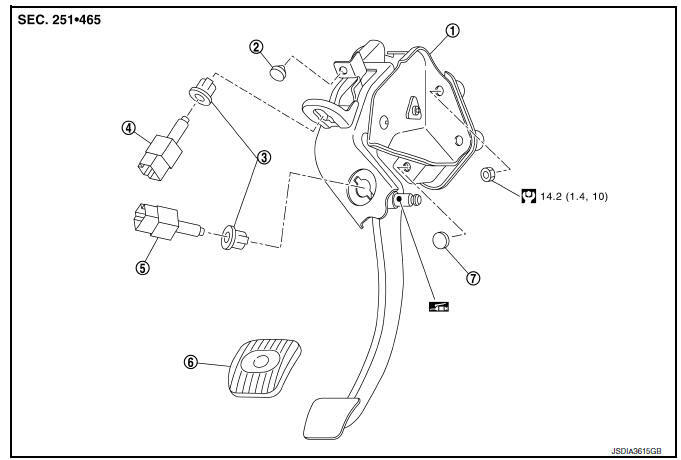 If damage or deformation is found, replace pedal stopper rubber. Check stopper rubber. If damage or deformation is found, replace stopper rubber. Check pedal pad. If wear or damage is found, replace pedal pad. Check the height of clutch pedal. Refer to CL-5, "Inspection and Adjustment".